It may just be “dirt” to us, but soil is home to your plants. When it comes to flower gardening and growing vegetables too, good bed preparation is the key to success. Whether your garden bed is predominantly sandy or full of clay, the solution to improving it is the same: adding organic matter, such as compost or well-rotted manure. 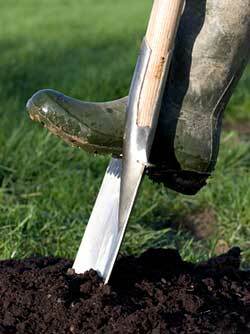 Here are two ways to get a flower bed ready – one involves digging or tilling, the other doesn’t. It’s not hard to guess which is easier. 1. Remove grass or other existing vegetation with a flat spade or kill with a glyphosate herbicide such as Roundup. It’s very important to do this job well, making sure that you don’t have grass or weeds growing where you want to plant. If using glyphosate, wait one week before spading or tilling the bed. The plants you sprayed should be turning yellow. 2. Spread two or three inches of organic matter, well-rotted manure, leaf mold (composted leaves) or compost, over the bed. over to a depth of eight inches with a garden spade, fork or roto-tiller, breaking up heavy clods. Rake level. You can start this project in early spring or in the fall – in either case, you’ll be ready to plant by the following spring. 1. Cut existing grass at your mower’s lowest setting. 3. Spread eight to 12 inches of organic matter (well-rotted manure, compost or a mix of compost and shredded leaves) over the layers of newspaper. Or use triple mix — a mixture of loam, manure and peat — available at garden centers. Rake level. 4. If doing this job in fall, let mound settle until spring; in spring, give it a season. Worms and soil micro-organisms will do the mixing and enriching — then plant right into the area without doing any digging. The settling action will give you a bed that’s just slightly raised.